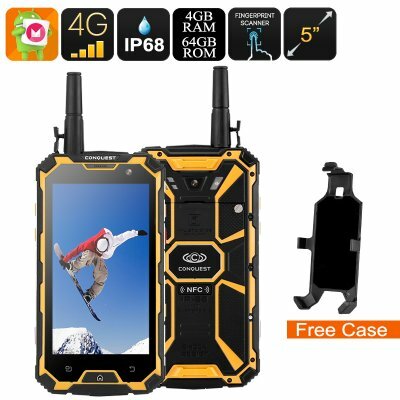 Successfully Added Conquest S8 Rugged Phone 2017 Edition - 4G, GPS, NFC, Fingerprint Scanner, IR, Android 6.0, Octa Core CPU, 4GB RAM (Yellow) to your Shopping Cart. If you need a phone that can perform anywhere then the Conquest S8 2017 edition is up to the challenge. With it's hardened rubber exterior this shock proof phone can survival knocks and drops. A waterproof and dustproof IP68 rating ensures its protected from dirt and liquid ingress so it can even survive being submerged in water. The 5-inch screen is protected by the toughened Corning Gorilla Glass 4, making it scratch resistant and all but indestructible. Especially suitable for anyone who works or spends much of their time outside. This rugged phone can tackle the harshest conditions and is designed to stand up to some serious abuse. Armed with an Octa-Core CPU, 4GB of RAM and a Mali GPU this rugged phone has enough processing power to handle demanding games and multitasking seamlessly. The 5 inch IPS display brings full HD resolutions and the contrast and brightness are such that you'll be able to enjoy a rich gaming and movie experience even in bright sunlit. Running on the Android 6.0 Marshmallow OS you're sure to find the navigations and features intuitive and easy to use. There is 64GB of storage as standard that can be doubled using the micro SD card slot so you'll have plenty of room for games, movies, music and picture. A secure back panel with rubber seal keeps the phone's battery and SIM slots as well as the internal circuitry protected from any water ingress. But once removed, using the included screwdriver, you'll notice the two SIM card slots as well as that huge 6000mAh battery. With 4G network support across a number of frequencies, you'll get fast download connections even on the go. Thanks to two SIM slots you can benefit from greater coverage by using SIMs from different carriers. This will also allow you to avoid roaming charges as well. Even if you're without any mobile coverage the Conquest S8 2017 can keep you in touch with those around as it features a push to talk walkie talkie function. This will allow you to communicate with people up to 5KM away over the UHF 400 to 470MHz frequencies. With up to 6000mAh of battery power this rugged phone can double as a power bank letting you recharge other devices while on the go. There is enough power for up to 600 hours of standby and there'll be plenty of talk time to boot. The phone also feature an array of sensors including temperature, barometric readings and also GPS and compass functionality. This ensures you'll never get lost whether you're exploring the wildness or a new city. On top of all this, there is an infrared transmitter as well as FM radio, Bluetooth 4.0 connectivity, NFC a fingerprint scanner and a 13MP rear camera. So you're well equipped for every plausible need.